Christopher was raised in Sterling, Illinois. He attended college at Augustana College in Rock Island, Illinois where he earned dual degrees in English and Economics, receiving high marks in each and captained both the Cross Country and Track and Field teams. He graduated from Augustana in 2004 and continued his education at Drake University Law School in Des Moines, Iowa, where he was a Dean’s List honoree, received the CALI Excellence for the Future Award (formerly known as the American Jurisprudence Award) and was a licensed student-practitioner in Drake Law School’s legal assistance clinic. Upon his graduation from Drake in 2007, Christopher began practicing with the Cedar Rapids, Iowa branch office of a large legal assistance firm, negotiating and litigating hundreds of cases on matters ranging from family and domestic violence matters to government benefits and unemployment compensation appeals. 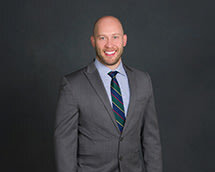 Christopher moved to Rochester in the fall of 2009, where he completed judicial clerkships with the Honorable Joseph F. Wieners and Honorable Kevin A. Lund. During that time he was responsible for drafting court orders, rendering accurate research and dispositional advice to judges on a variety of complex civil and criminal cases, and facilitating the successful negotiation of conciliation court claims. By virtue of this time spent working for judges and the courts, Christopher has valuable insight into the judicial decision-making process which he brings to bear in the successful representation of his clients.